Well, I guess we can all do a long exhale, as the inevitable has occurred. Chandler Burr, esteemed critic of the olfactory has passed into bafflement. Like Frank Bruni stomping out of Vong, steam billowing from his ears or a claque of Michelin Guide Rouge critics casting a Tour d’Argent duck-press into the Seine, Typhoon Burr ripped through Kerala yesterday with as much violence as Kathleen Byron in the climax scene of Black Narcissus. Jean-Claude Ellena managed to escape the 145kmh winds, while saris whipped about palm trees and servants fled to high land. Hermès Un Jardin Après La Mousson was panned. It is, he writes, “a failure on every level, and its failure is so strangely complete, so weirdly disorienting, that after I had repeatedly smelled the bottle delivered to my office — put it on colleagues, offered my arm to strangers — I came to distrust that what I was smelling was the intended perfume.” Ellena, who Burr shadowed throughout the lead-up to the writing of The Perfect Scent, has his fair share of admirers, and in retrospect it would appear that Burr was one of them. The tone of the review remains one of grudging respect, despite disappointment. Burr would be the first to admit that even the greatest noses are capable of colossal failures. No less than Jacques Cavallier, Michel Almairac and a host of others have been dealt one-star reviews in the past. But my beef is not with the rating––it is with the review itself. Burr’s assessment begins with a rather convoluted discussion of Hedione (the chemical responsible for the success of Edmond Roudnitska’s Eau Sauvage and Diorella) and a denigration (no fault there) of the much-overused aquatic Calone. He initially allies the rain-soaked facets of Un Jardin Après La Mousson with the latter, but later reveals that, with the help of a gas chromatograph, he realized it contained none. He then gallantly throws his mistaken assumption into striking relief by revealing that it is chock full of Hedione. Traditionally Hedione, also known as methyl dihydrojasmonate, has the effect of reanimating floral notes, making them positively shimmer. Ellena first used it in an über-opulent success of his youth, First by Van Cleef & Arpels. Calone? Hedione? Chromatographs? By this point, any reader is straining for a description … for any form of subjectivity that transcends the mere sticking of said star to waterlogged page. Perhaps Burr assumes that the reader knows the score (in every sense) and has read his books. (From the consistent weirdness of most of the comments on the T-magazine blog, I have to assume not.) Ellena is the master of minimalism. Each of his Hermès compositions, the hard-to-find Hermessences included, is a take-it-or-leave-it study in doing without. For better or worse, these are crystalline compositions exhibiting in each iteration a trademark clarity. They are eminently wearable, if just a bit steep in price. But this is Hermès, after all. Realistic pricing would dull some of the appeal. Whether you like it or not, Un Jardin Après La Mousson fits the mold. Perhaps (perhaps) its weak point is a dull consistency. I, for one, think the natural vetiver is handled very well. I’d reach for this. It doesn’t bother me, but neither does it bewitch. That said, Chandler Burr’s review bewilders me –– Or does it baffle? –– Oh, I forget. I was totally baffled by Burr's review. I mean, why would he review something that he admits he still doesn't understand? Why smack it down as a failure when he hasn't yet been able to wrap his brain around it? I thought Un Jardin Apres la Mousson was terrifically subtle and almost strangely beautiful (and I'm using the word "strange" in its most literal sense). Its initial seeming minimalism is just a cover for its actual complexity, and I haven't smelled anything else like it. I think that's probably what I admire the most about it. Individuality is hard to come by, especially in a perfume bottle. I would have given it more than one star. 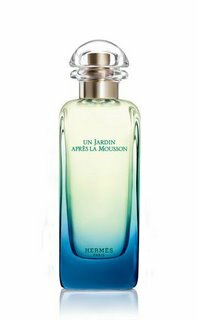 I'm not really a fan of melon notes in perfume, but Après la Mousson was so exactly what the melon-and-ginger water I drink in copious amounts in summer smells like, that my association was not the expected and dreaded "sweet, sticky, fruity, yuck" but instead "fresh, cold, refreshing, bright". Unfortunately, the entire thing disappeared from my skin after about five seconds. And reappeared some 10 hours later with a whiff of fresh ginger. It's strange, it's baffling, but much to my own surprise (not being a terrible Ellena fan) I do like it! Dinazad, Melon and ginger water sounds very, very nice in this humidity. I, too, am not the biggest fan of melon notes but isn't it funny that, given the misunderstood-in-its-time genius of Roudnitska's Parfum de Therese, this too contained spiced melon? Just a thought.